Officials praise 'commitment and determination' of government in seeking to deliver 'strong and stable economy' for Argentina. 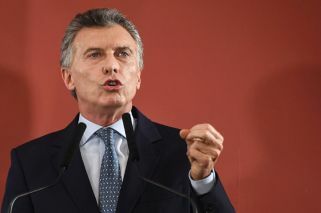 Finance Ministers from the Group of Seven nations have issued their strong support for President Mauricio Macri and his administration, hailing the government's "commitment and determination" in attempting to deliver a "strong and stable economy" for Argentina. "We strongly support the commitment and determination of the Argentine authorities to achieve a strong and stable economy that benefits the population," they said in a communiqué issued by the French Ministry of Finance. economy and promote growth" in the statement. The G7, made up of the seven richest countries in the world, cited Argentina's recent agreement with the International Monetary Fund (IMF) worth US$57.1 billion, support which the Macri administration will hope stabilise the country following the recent depreciation of the peso. Argentina's currency has lost half its value against the dollar in 2018, hurting the purchasing power of millions of ordinary Argentines, along with inflation, which is forecast to reach over 40 percent by the end of the year. The leaders of Germany, Canada, the United States, France, Italy, Japan and the United Kingdom said government's aims were "reflected in the recent agreement," which is currently being considered by the IMF's Executive Board. Speaking yesterday, Economy Minister Nicolás Dujovne said Argentina is going through a recession that will last "a while." "There is something that is inevitable: we are going through a recession," he said in an interview, attributing the situation to "a series of events" that the country has faced this year.